Before I had even washed my sweat and hard work off in the shower — my mind was being flooded with visions of pancakes, mounds of butter, rivers of maple syrup. Stacks of pancakes smiling at me like a creepy clown! Luring me in. Cut it out! Go away! I’m trying to be Good! Yo Diane — you are forgetting the lesson you learned just yesterday. There are no Good Foods and Bad Foods. There are only foods you have planned for and those you have not planned for. And this time…..this Sunday…..we have NOT planned for pancakes, butter and syrup. So this time….we aren’t having that. But….maybe another time…you can! Freaky weird. In that moment, I felt immediately better. More relaxed. More ‘IN” to going to iHop with the family. As we walked out the door and hopped in the car, I was praying that my mindset would be as strong once I got a whiff of the buttery pancakes and sugary maple syrup. I found the Two Egg Simple and Fit breakfast — which was perfect for me. Two egg substitute, two slices of turkey bacon, a slice of dry wheat toast and fruit. Add in a cup of coffee and it was a perfect 9 ppv breakfast. My girls had pancakes. Even Peter ordered my favorite Hearty Nut and Grain pancakes…..but interestingly enough — I was not tempted at all. I was v. happy with my 9 ppv breakfast. It was tasty, filling, enjoyable — AND — I felt super duper wonderful that I could go out, with my family, and just order a meal that was right on plan. 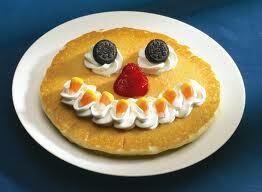 Hey You –>Creepy Smiling Pancake — Keep smiling. You Don’t Bug Me Anymore. I can have you — when I want! IF I Want. And the funny thing was…..knowing that I could have you……Helped me say NO!! Deep Breathe. What a great day.